Today’s Photo Friday installment highlights a seminal event in Anabaptist history: a 1961 dialogue between Mennonite and Brethren in Christ leaders and Billy Graham — at the time, one of America’s most famous figures and undoubtedly the “face” of popular American Evangelicalism. No doubt others in the group had been similarly impressed by Graham’s style and presence — and no doubt they were aware of his celebrity among most of America’s Christians in the 1960s. Likely it was this combination of professionalism and popularity that led these Anabaptists into dialogue with “America’s preacher.” If they could convince Graham of the gospel message of peace, perhaps he could proclaim that message far beyond the bounds of American Anabaptism. Interestingly, the event also crops up in a recent analysis of the “fragmentation of Evangelicalism” written by religion scholar Molly Worthen. In her post, Worthen argues that the mid-twentieth century popularity of Billy Graham among conservative Protestants projected a public image of Evangelicalism as unified across denominational lines and cooperative despite varying theological emphases. The reality, Worthen concludes, was much more complex. Numerous groups — Pentecostals, Southern Baptists, and Mennonites and Brethren in Christ among them — admired Graham for his popularity and conversionist message, but felt that aligning themselves with the so-called “Evangelical coalition” represented by the National Association of Evangelicals might compromise their denominational authority. Interestingly, Worthen’s conclusions about Evangelical complexity echo my own observations about the ways in which the Brethren in Christ reacted to the rise of post-World War II Evangelicalism — the kind of Evangelicalism, at least, represented by Graham, the NAE, and other outfits like Christianity Today and Fuller Theological Seminary. 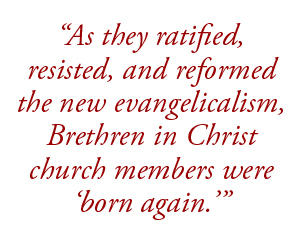 As I’ve argued elsewhere, the Brethren in Christ really responded not just by joining the NAE — and thereby ratifying the claims of the post-war Evangelical movement — but also by resisting identification with this broad contingent of Protestants, and even, in some cases, seeking to reform these fellow Christians. E. Morris Sider, Messenger of Grace: A Biography of C. N. Hostetter, Jr. (Nappanee, Ind. : Evangel Publishing House, 1982), p. 216. 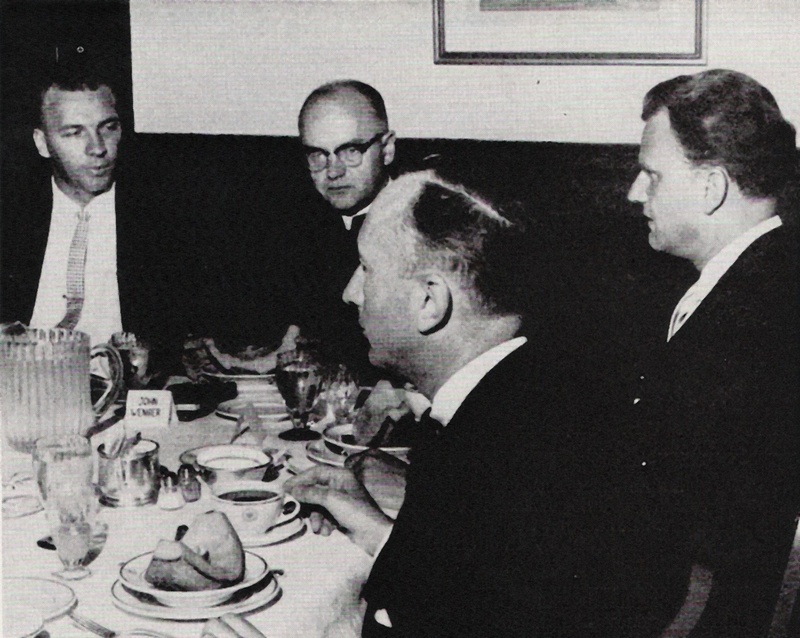 “Sixteen Church Leaders Meet with Billy Graham in Philadelphia,” Evangelical Visitor, October 21, 1961, p. 14.